Tart and sweet, rich and light: a great summer pie. Place oven rack in the center of oven and heat to 375°F. Combine crushed graham crackers, melted butter, sugar, and salt in a medium bowl and mix well. Press mixture evenly into a 9-inch metal or ceramic pie plate and bake until lightly browned, about 10 minutes. Let cool completely on a wire rack. Combine cornstarch, sugar, egg yolks, and lemon juice in a medium-size heavy saucepan. Add water and whisk until blended; use a rubber spatula to scrape the sides and bottom of the pan to make sure mixture is well combined. Cook over medium heat, whisking constantly until mixture comes to a boil. Boil for 1 minute, stirring constantly. Remove from heat, add butter and lemon zest, and stir vigorously until butter is completely melted and ingredients are thoroughly combined. Pour mixture into graham-cracker crust, cover with a round of waxed paper or parchment paper, and let cool to room temperature. Combine egg whites and salt in a large, clean bowl and whip with a hand mixer on high speed until soft peaks form. Gradually add sugar and continue beating until stiff, glossy peaks form. 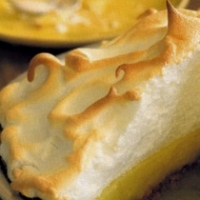 Remove the paper from pie and spoon meringue over lemon filling. Spread meringue with a spatula so that it covers the entire surface of the pie, sealing in filling. Be sure meringue meets the crust, otherwise it will shrink inward, exposing filling. Bake until meringue is golden brown, about 10 minutes. Let cool to room temperature on a wire rack, then refrigerate until filling is cold, at least 4 hours. Slice, and serve chilled. I made this pie last night and it was absolutely delicious. The filling was thick and lemoney and the crust was really good. I will be making this again. Thanks for sharing. I was recently thinking about making a lemon pie-- glad you posted! Nicely post and lovely sweet recipe! Like ebonyeyedenigma's recipes? Never miss an upload!